In December 2014 we were working on a big and very interesting project (here is a case study if you are interested in – Tourism website with booking and map). There were a few last minute changes which had to be completed before the end of the year. That said – we had two weeks of chasing the deadline and I was 100% focused on this very project. Every day from this period I stared with opening Asana, the project management system we are using at DevriX, the project’s GitHub repository and Aptana, checking my tasks and the last changes, adding new features and improving the existing code base. 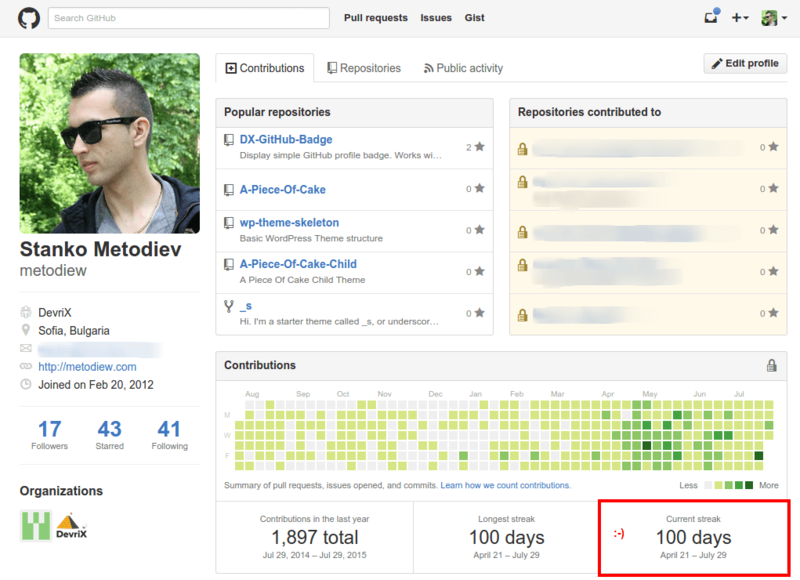 I ended up with a streak of 15+ days with GitHub commits. When I noticed the number, I realized that I can use this streak as a motivator for my personal development and skills improvement. I managed to add a few more days to the streak and we released the first phase of the project. A few days later something came up and my streak was suddenly interrupted. In the next few months I had a few similar streaks with 10/15 days, but nothing impressive back then. A few months ago we were discussing the Tourism project and the huge amount of work we’ve managed to do for short period of time. I remembered the series of commits and I decided that I’ll try to make a new attempt. This time I said that I’ll go for 100 days. It sounded ambitious, but doable so I started to commit every single day. At least one line of code. First it was 10 days, then a month and it was time to go for 50 days and so on and so on. To be honest, some of the commits weren’t something impressive. I had a few commits with one line and/or changing a single word or something like that, but in general almost all of the updates were for clients’ projects and improving my WordPress plugins, dotfiles and some personal scripts and tools. For some reason I didn’t write this blog post earlier, but the important thing is that today I manage to add my 113th GitHub commit and I’ll continue for as long as I can and we’ll see how far will I go.